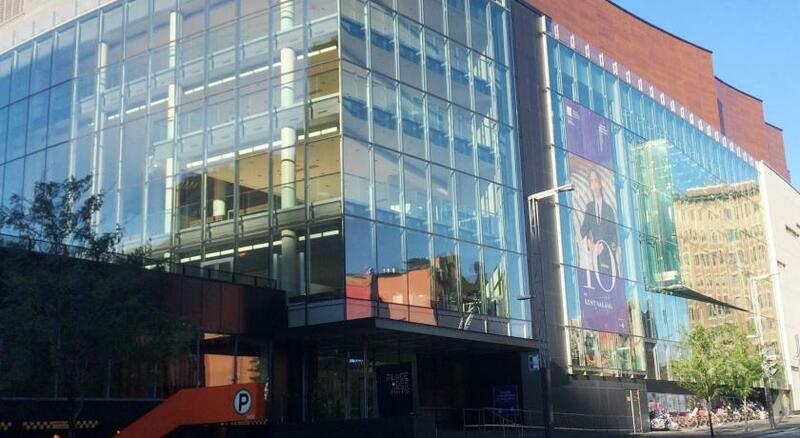 Lock in a great price for Holiday Inn Montreal Centre Ville Downtown – rated 8.1 by recent guests! The location and the staff always kind and ready to help. Very friendly staff,excellent Chinese restaurant and outstanding location. My only comment is breakfast has no variety,itvserves same food everyday. The front counter staff was very nice and helpful, especially the young man who worked at the front counter on Thursday, Aug. 30th around 1pm when we arrived from airport. I don't know his name. I was one of the lucky ones who got a room even though we was too early for check-in. The lobby looks very pretty and nice with the nice decorations and design including the water and fishes. Great to have many lounge chairs for guests to hang out with friends and families. The room was clean and bed was very comfortable. Most importantly, the location was excellent. We loved being in Chinatown, close to food, shopping and the old port Montreal area for sightseeing. 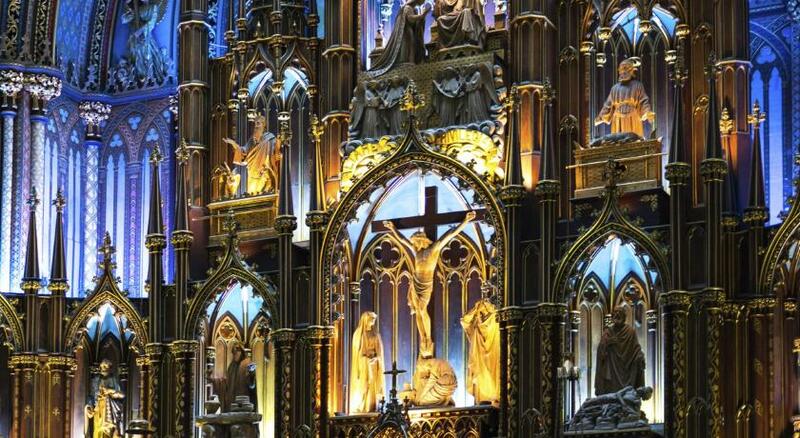 We like staying here every time we visit Montreal. Room was very comfortable and clean. 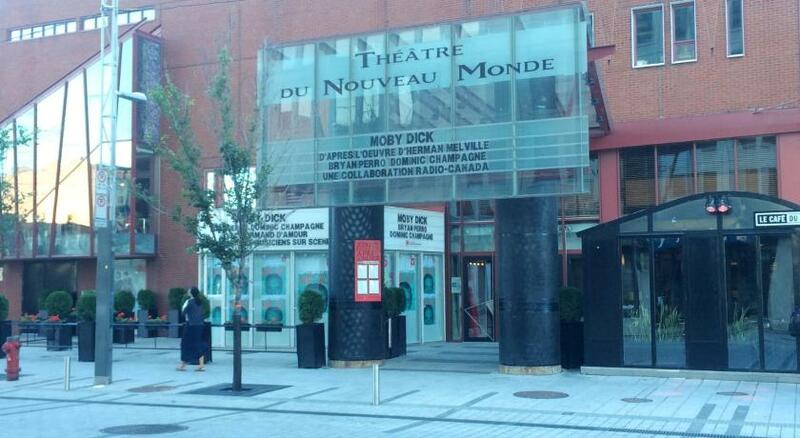 Very centrally located to Old Montreal. Subway station was diagonally across the street. Good sized fridge for our drinks & snacks. Comfortable bed. Pool looked good but didn’t get a chance to try it. Friendly Hotel, on the edge of China Town and perfectly located to see all the sites in Montreal Old and New Clean comfortable and quite, good service and good for kids having a swim pool and the added Bonus of the Koi Pond and Oriental themed lobby area. Come and go Car parking under the hotel. 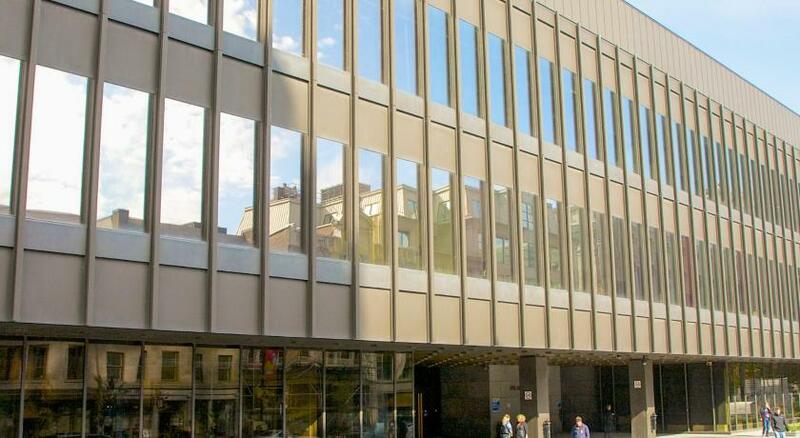 Holiday Inn Montreal Centre Ville Downtown This rating is a reflection of how the property compares to the industry standard when it comes to price, facilities and services available. It's based on a self-evaluation by the property. Use this rating to help choose your stay! 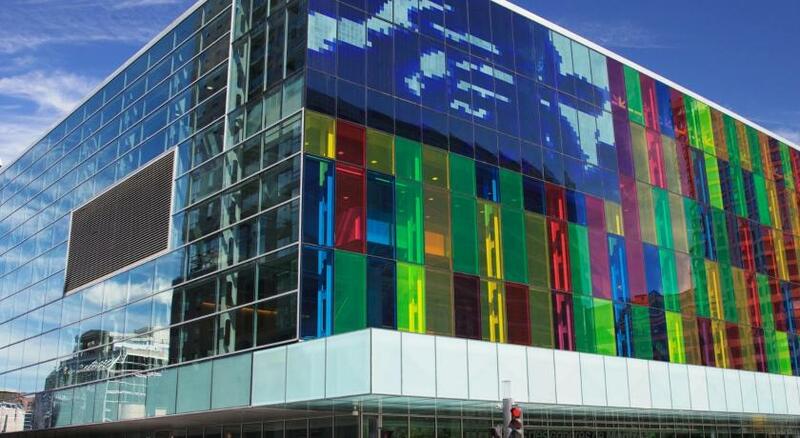 One of our top picks in Montreal.Located across the Montreal Convention Center and 20 minutes’ drive from the airport, Holiday Inn Montreal Center Ville Downtown offers free WiFi. The hotel features an indoor pool and fitness center. 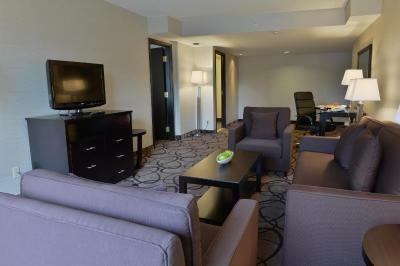 A cable TV is available in each room at Holiday Inn Montreal Downtown. There is also air conditioning, a desk and a coffee maker. A hot tub, sauna and massage facilities are offered at this hotel. 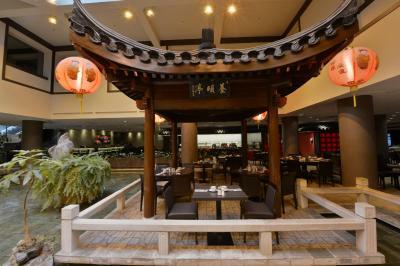 Guests at the Downtown Montreal Holiday Inn can enjoy gourmet dining at the on-site restaurant Chez Chiné. The property also has an on-site gift shop. Holiday Inn Montreal Center Ville is less than 5 minutes’ walk from Chinatown and one block from the shops of Old Montreal. Guests can easily access the Underground City, only 12 minutes' walk from the hotel. 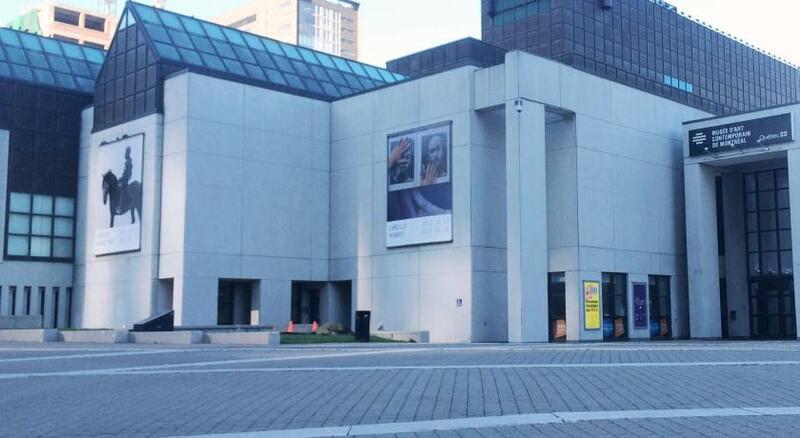 When would you like to stay at Holiday Inn Montreal Centre Ville Downtown? 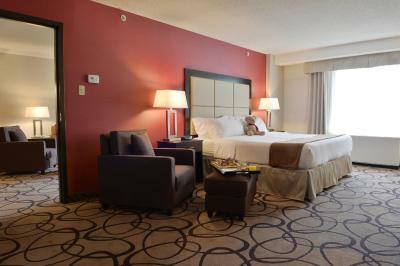 This spacious room offers an arm chair and a spacious bathroom. Public parking is available on site (reservation is not needed) and costs CAD 24.35 per day. This room features a work desk and a spacious bathroom. This room offers wheelchair accessibility, and a lower bed and seating area. 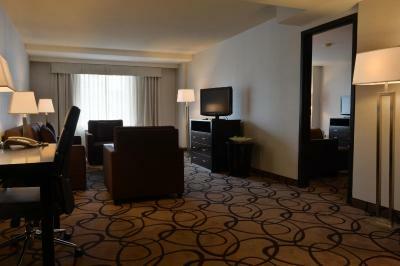 Offering more space, this family-friendly room has a cable TV, air conditioning and seating area. 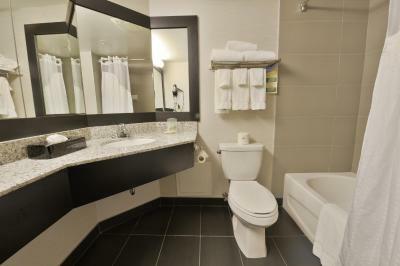 This spacious suite offer a seating area, a 3-piece bathroom and an extra bathroom with only a toilet and sink. This spacious and modern room offers a balcony boasting unlimited city views. Located on the top floor, this spacious room features unlimited views of the city. House Rules Holiday Inn Montreal Centre Ville Downtown takes special requests – add in the next step! Holiday Inn Montreal Centre Ville Downtown accepts these cards and reserves the right to temporarily hold an amount prior to arrival. Please note, breakfast inclusive rates will include a complimentary voucher for up to 2 adults and 2 children under the age of 11. Additional charges apply for older children, contact hotel for details. Please note, the credit card used upon reservation will be asked upon arrival. Keurig machine needed to be cleaned out. More generous supply of coffee/ tea could be offered - one regular,one decaf and one tea was not adequate for two adults. Room, bathroom, beds and bedding were all immaculately clean and comfortable. 1- Literally, all the gym equipment is out of service. 2- The room's carpet need to be changed or really cleaned. It stinks, 3- You can put a bottle of water for free, or remove it completely instead of asking for $4. I just don't find it appropriate. The convenience of the location, the lobby area and the restaurant. It would be great if they can offer turkey sausage/bacon as opposed to pork only. I used the treadmill in the gym and although it worked the speed was inaccurate and broken. The gym could have used a fan. Also the air conditioner in the room was noisy, not a big deal but couldn’t adjust the speed which may have made it quieter. Bed was very comfortable and the bathroom was clean and had good water pressure. Very good location for eating and site seeing. The cost was reasonable for the location. There wasn’t much to dislike apart from the fact that the hallways leading to the rooms weren’t that bright. The ambiance was great! Would highly recommend it. Perfect location! 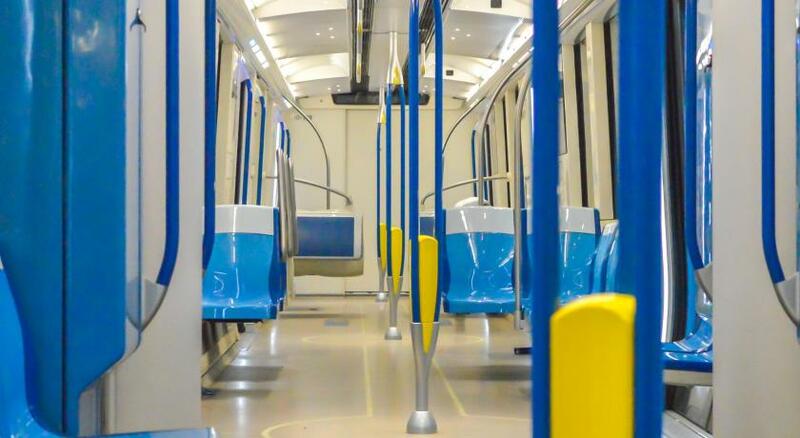 3 stops on the Subway to the Bell Centre and 3 blocks from Old Montreal. Loved it! This hotel give me a good environment! Gym facility to small and not enough training equipments. Cleaning is not standard, in level 9 it is good,but in level 8 the cleaning is poor.And the lifts are not so good when they stop they always make me jump. Bed and pillows are comfortable . I found the parking t be very expensive. I tough it would be included in the price of the room.